In 1921 a badger, a chaparral, a coyote, a rattlesnake, a prairie dog and a buffalo were all nominated as the school’s mascot by the student body, and it was a heated debate until T-Anchor cowboy L. “Parson”Gough took the floor. He described an adventure he had in 1892, when he and another cowboy had roped two buffalo calves on the very site where Old Main was built. The student body stood in unison to cheer for Gough’s nominee, and the buffalo has served as a majestic symbol of the University ever since. 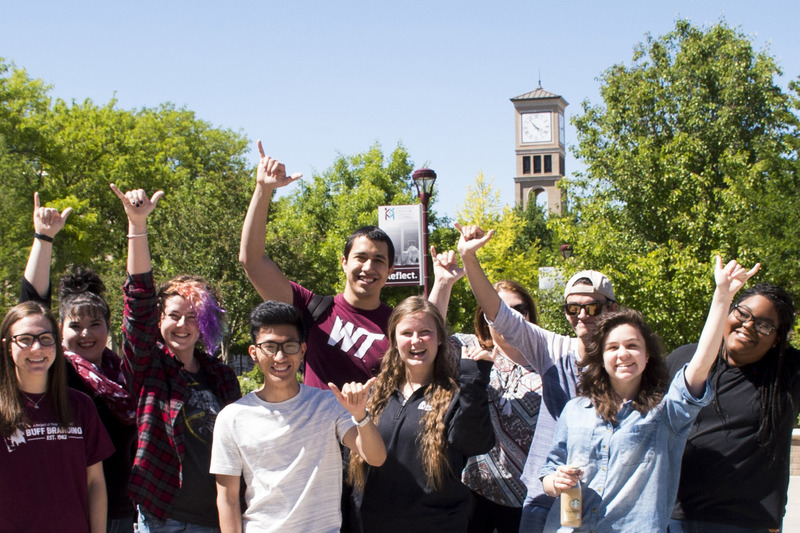 WTAMU is one of only a handful of schools that still has a live mascot. 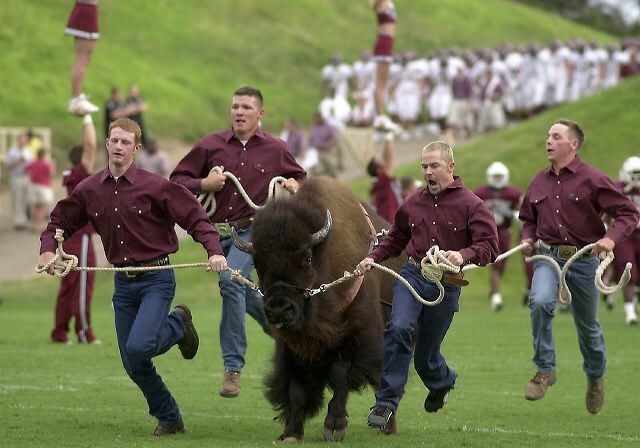 Everybody loves a touchdown, but it's the traditional buffalo run across the field that really gets everyone excited, especially when the University mascot hits stride and the Herdsmen handlers lose their footing. It's all part of the game. The University's Fight Song was written by Jack Curtice, a member of the football coaching staff from 1938 - 1941. Other fight songs have been introduced, one as recently as 1963, but none have been able to undermine the popularity of Curtice's "On, On Buffaloes." W – T – A – M, WTAM, Fight! Fight! Fight! The University's Alma Mater was written in 1921 by S. Elizabeth Davis, assistant professor of English. During the years that chapel attendance was required, the singing of the Alma Mater was a ritual that brought the morning's program to a close. " Sing with enthusiasm as well as with reverence and feeling," Wallace R. Clark, head of the music department, would say. He was equally adamant about singing the Alma Mater only on appropriate occasions. "It is a hymn," he declared firmly, "and should be sung with a reverent attitude when and where a spirit of reverence is fitting." Students learned Clark's lessons well, and even after more than 80 years, the Alma Mater is sung in reverence by current and former students, standing tall and with "horns" held high. Souls as pure and free! Fold your middle three fingers to your palm, extend your thumb and little finger and you've got your own set of buffalo horns. The sign, with hand held high, is proudly displayed during the alma mater, when a player is injured and as an energetic addition to cheers and the fight song.